Activists and independent reporters have attributed the flood crisis in Uttarakhand to the unplanned development of dams, roads and tourist traffic as the major reason. Four districts of the state Chamoli, Rudraprayag, Uttarkashi and Pithoragarh have been seriously affected by the present disaster. 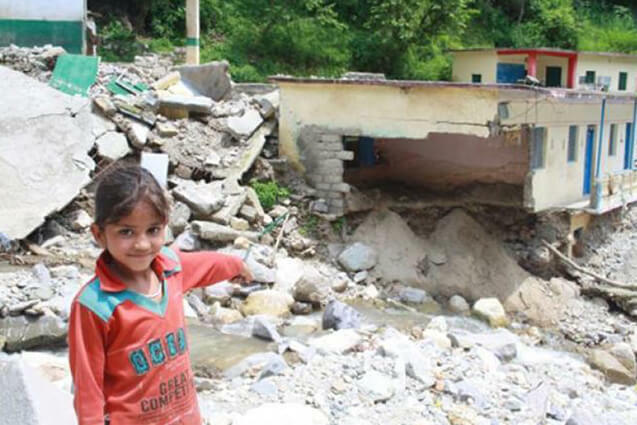 In its emergency response ActionAid India is intervening in Chamoli, Rudraprayag and Uttarkashi districts. I was working in the Chamoli district where Actionaid is intervening in 36 villages in four blocks Joshimath, Tharali, Naranbagad and Dewal. The relief operation in the district is facilitated by JANDESH, an LRP of Action aid operating from Joshimath. As part of the relief support, ActionAid India, with the help of its partner organization JANDESH, is proving food items as well as non food items to the disaster affected families. It was planned to distribute food items and blanket to 700 families, Hygiene kit to 600 women, Tarpaulin, Solar lantern and Utensils to 150, 600 and 289 families respectively. A fifteen member team of Jandesh is fully involved in the relief work supported by six volunteers from the disaster affected villages. The present disaster has led to an unprecedented effect on the life and livelihood of people in the region. As per a rough estimate by the state government, more than 5000 people are either missing or dead, though the number estimated by non government sources is more than ten thousand. Many places in the disaster affected region used to get huge tourist inflow but there is no fool-proof system of tracking tourists that was operational. This makes the estimation of death mere speculation as majority of the people who died in the disaster were tourists. According to Jandesh estimate, nine persons from its intervention area also died during the flood. All of them who died during the disaster were males and were the primary bread winners of their respective families who had gone to collect some kind of herbs in the hills. Road transport has been seriously affected. As per the rough estimate by Government of Uttarakhand more than 2000 roads which have been affected or badly damaged. The Border Road Organization (BRO) is struggling hard to keep the National Highway No. 58, which connects Joshimath to Deheradun functional but, condition of internal roads is getting worse. Urgam valley, 15 kilometres from Joshimath is one such example, where ActionAid is working on disaster response. It is difficult to reach there even on foot. The valley has 12 villages with a population of more than 3500. According to Mr. Harish Rawat, Programme Coordinator Jandesh, it may take years to get it functional. The damaged roads are affecting transportation of relief material, emergency stuff and even patients. According to Rama Bhandari, president of Penkhanda Mahila Parishad a local CBO, whom so ever could afford it have sent their pregnant women to nearby towns, fearing continuing landslides causing roadblocks could affect in case of emergencies. Local people mostly depended upon tourism related employment and agriculture both of which has been hit badly from the disaster. After huge numbers of deaths, destruction and lack of transport and communication the inflow of tourists has completely stopped. The disaster hit the region during the peak tourist season and now majority of the hotels in Joshimath have already shut down and huge numbers of people employed in tourism and related sector have lost their source of livelihood. The devastated flood also washed away meagre cultivable lands available to the local population as majority of the agricultural lands were close to the rivers in most of the villages. In Pandukeswar village where ActionAid is working almost all of the cultivable land has been washed away along with 3-4 houses as the river changed its course there. In a meeting with members of Penkhanda Mahila Parishad one of the mothers said “Hamare Bachhe to apda ke bad murjha gaye hain” (our children have become dizzy and inactive in the aftermath of the disaster). This is the standard response from the teachers and other community members on psychological status of children. While discussing with one of the coordinators of GMR foundation which runs a library and child recreation center in Pandukeswar village, she was of the view that they used to struggle to accommodate all children in their hall prior to the disaster, now only few children turn up to the center. During the discussion with the children’s group it came out clearly that children get scared whenever it rained and avoided venturing out of home. According to Mr. Dharam Sing Negi, assistant teacher in the Government primary school Devgram, opening up the school has come as a big relief for children. He told that it took children more than 15 days to resume their schooling. This shows the psychological trauma the children are going in the aftermath of the flood. In some of the disaster affected villages school building has been either damaged or declared unfit for use. This forced the school authorities to accommodate children in any other public building available in the village. In the Pandukeswar village the government school building has been declared unfit for use and all children from the school have been relocated to one room in the GMR foundation’s library, which is now affecting the schooling of the children. Priyanka, 13 who is a member of Talla Barginda Bal Panchayat pointed out that girls’ toilet in their school got damaged during the flood and many girls are feeling uncomfortable to go to school. It shows there is a high chance of children specifically girls dropping out from the school if the issues was not addressed soon. The destruction of the roads also disrupted the supply of food material to schools and ICDS centers, which may disrupt the distribution of Midday Meal and hot cooked meal in schools and ICDS centers respectively. It can also affect the attendance of children in these institutions. It was observed from the meeting with community and children that drinking water and sanitation are two issues that need to be addressed. For majority of families their source of drinking water is the perennial streams in their village from which water is mostly consumed unfiltered. The members of the children’s group were of the view that even if their school has water filters it was used only by their teachers and. Mr. Dinesh Chandra from Urgam valley shared a list of twenty children from the region, studying in the colleges and engineering schools, possibly dropped out of it this year as their parents are unable to meet their study expenses due to loss of their livelihood. Most of the families were employed in tourism related sector. According to Mr. Chandra these are the first generation children who got in to higher education from their respective families. It was shared by the Jandesh staff that in the last couple of years there has been an emerging trend of young girls married off to men from mostly Punjab, Haryana, Rajasthan, etc. According to Mr. Harsih Rawat, the programme coordinator for Jandesh, in all such reported cases girls were from Dalit families aged between 15 to 20 years, whereas grooms were double the age of the girls. In these marriages, groom bears the marriage expenses along with paying around Rs. 20,000 to 30,000 to bride’s family. According to Mr. Rawat, in most of the cases relatives of the girls connected the groom and the girl and were paid a commission by the groom’s family. As the disaster has affected the livelihood opportunities of the local population, increase in bride selling is quite possible. The effect of disaster on the livelihood of the people may also lead to increase in child labor and school dropouts in the region. The disaster has also led to the disruption of transport and communication particularly the road network in the region, which is also adversely affecting the local health services. It was reported by the local community in Pandukeswar and Barginda that the health services in general and even immunization of pregnant women and children has become very infrequent. The absence of health personnel along with delay in supply of vaccines to the affected villages is mentioned as the major reason. If not resumed in time it might have serious consequences on maternal and child health in the region. A meeting was held with the Bal Panchayat member from Talla Birginda village. More than 30 children between 10 -15 years participated in the meeting. The discussions were mostly focused on the impact of disaster on children and its response. All children were of the view that in the case of disasters, all families needed to be supported irrespective of their economic and social status. The children wanted to know the reasons behind the flood in general and the cloud burst in particular. When one girl asked about the effect of flood on children Priti told: “abhi barish se bahut dar lagta hai” (we are very afraid of rain now). Majority of children said that they preferred not to go to school when it rained. The children also shared their concern regarding the unsafe water being provided to them in the school and the girls’ toilet being damaged due to floods which is affecting girl’s children. While discussing on emergency response, Priti questioned the reasons why children were not consulted before providing relief material to the affected families. She complained that the relief kits provided to their families did not contain any item for children. Then, the group listed out the items that should be part of each relief kit provided to families. According to the children relief kit should consist of books, Notebooks, story books, compass box, school bag, floaters, shoes and clothes for children, school uniform, milk powder, chocolates (specifically the long one), biscuits (both sweet and salty), play materials, toys, etc. During the discussion Manisha made it a point that schools should be given water filter so that children can drink clean drinking water in the school. Children also were of the view that they can support the relief team in preparing the list of families with children. The children’s group also felt shelters should be constructed in each village so that people can stay there during floods. According to the children such shelter should be built up in an area with a safe distance from river. The group was of the view that shelter should be built near a play ground and it should have a separate room for children with toys and play materials. The discussion with the children group shows that children see and think more holistically than adults and can articulate well with some facilitation. Training on disaster preparedness: If we look into the reasons of the disaster, it seems it is not going to be a one-off affair. The local population needs to be sensitized and trained to face any recurrence of such disasters in such disaster prone areas. The project staff of Jandesh, its CBO members and community also need to be sensitized on the causes of disaster and preparedness for the same. Involving children in Disaster management: The discussion with the children’s groups showed that they recognized the wider dimensions and complexities of risk reduction and had a holistic view of the effect of disaster on the life and livelihood of community. Therefore, children should be heard as they have the ability to provide information and ideas that are valuable for survival, care, and protection of the children as well as the community. Efforts should be made to involve children in the disaster management processes. Children can play an important role as informants within the community in disseminating information and raising awareness in the communities. Children also recognize environmental hazards alongside social and economic threats and are able to understand the more complex interplay between hazards and vulnerabilities. Few children from each Bal Panchayat should be trained in a centralized training with the support of Jandesh Group, these children in turn can train rest of the group. Setting up child recreation center: Children’s recreation centre should be set up in all the disaster affected villages that Actionaid is intervening. Such centres should be placed in such a location/ building, which all children have equal access. It is better to set it up in a public building like schools, ICDS centre, etc. Play material should be provided to the center after consulting the children’s group. A local volunteer can be engaged at least for first few months for facilitating the center. Relief material: Efforts should be made to consult with the children during the planning for emergency response. The relief kit should also contain the food and non food items for children. Water and sanitation: Looking into the water and sanitation condition in the disaster affected region, community should be sensitized through local CBO on making water safe for drinking by boiling it. Sanitation facilities also could be improved through the Total Sanitation Campaign. If possible we should provide water filter to schools. Protection issues: There are possibilities of increase in child trafficking in the region through the sale of child brides. Community in general and children in particular should be sensitized on the issue. Child protection committees should be formed in the disaster affected villages after sensitization of project staff and CBO members. There are high chances of children, especially girls dropping out from school. The local CBO members, SMC members and Bal Panchayat members should be sensitized to identify such cases and bring it to the notice of Jandesh and teachers. The project staff should undertake immediate efforts to regularize the children in schools. Children group: Jandesh has formed children’s Panchayats in most of its intervention villages. Efforts should be made to constitute such groups in all the disaster affected villages and making it inclusive of children of all castes and communities. According to Jandesh staff, number of schools and Anganwadi buildings have been damaged or partially affected during floods. A quick survey should be undertaken to identify the details of such schools and ICDS centres damaged. The list could be used in the advocacy efforts with the concerned authorities for restoration or rebuilding of the infrastructure. The authorities should also be pressurized to ensure water connection in the toilets and the supply of safe drinking water in all the schools and ICDS centers. It was shared by the school teachers that due to lack of supply of ration the distribution of mid day meal and hot cooked meal has almost stopped in schools and ICDS centers. The local authority as well as the child rights bodies like SCPCR and NCPCR should be approached for the restoration of ration supply to schools and ICDS centers making the scheme functional. The vaccination programme has become very infrequent in the aftermath of the disaster. The Health and WCD departments should be pressurized with detailed evidence in hand for timely vaccination of pregnant women and children. As already mentioned, the few children who have got in to higher education institutions from the area are on the verge of dropping out. The government could be pressurized to provide fellowships to such children. The land and livelihood of the local communities have been seriously hit by the disaster. Advocacy efforts can be taken up to link MGNREGS in land restoration and other rebuilding efforts.